I've known Lily and Anthony a long time. I was so glad to finally get to do a family portrait session with them and their adorable baby girl, Naomi. I can't believe she's almost one year old already! We only had an hour for their portraits, so we turned their property into our location, starting on their porch with their striking red door, then moving to the top of a hill with pine trees in the background, and finishing up with a spot in their backyard where there were some pretty ferns to play around with in the foreground of the photos. Naomi got her hands on a fern and started tickling their dog, Ada's nose, which made for a really sweet picture. In fact, Ada was a huge asset to our shoot because not only was she super cute sitting in on a bunch of the family portraits, but when she was off camera, she was making little Naomi just crack up, so we were getting some really good smiles that way! I'm so happy to be in Charlottesville now so I can see this little girl grow up! 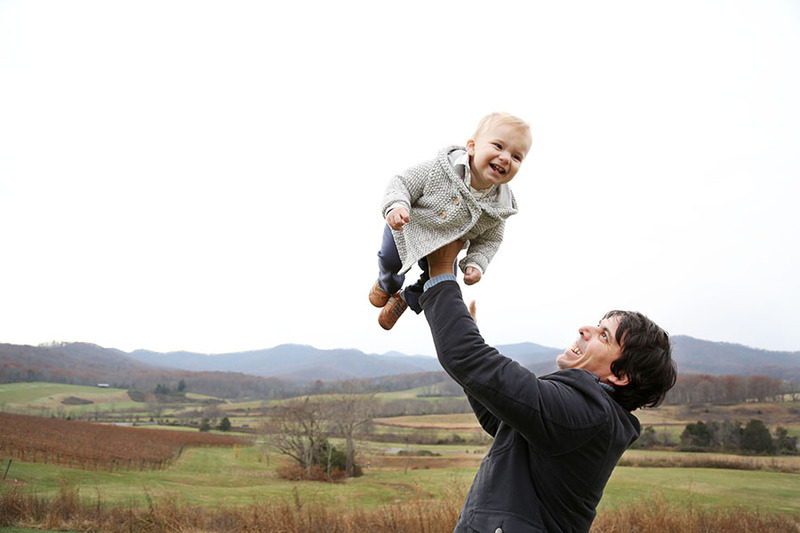 I spent a lovely couple hours with Kate, Jeyon and their sweet little boy Romeo at Pippin Hill Farm, taking family portraits with the blue ridge mountains as a backdrop (not too shabby), exploring the grounds and afterwards, the wine list and menu! Romeo seemed ecstatic to be thrown up in the air by the confident arms of his daddy. It was pretty cold out, so after our shoot, we cozied up to a big outdoor heater on their enclosed patio, and ordered a cheese plate, olives, apple crisp and honey ice cream! I tried a Viognier, which I have been seeing a lot of down here in Virginia ("down here"...you can tell I've been up North for some time...) This was my first time at Pippin Hill. Hopefully some day soon I will get to shoot a wedding at this venue- what a gorgeous location!